Do you regularly shop online for everything you need? If you do, you can get back a portion of your money spent on your purchases now. Read more about it below and then enter contest to win a free TV. Shopping online lets you search for the best deal, and when you shop through Beesavy, you will earn cash back on all your online purchases. Yes, there will still be a need to go to an actual store, and I do love to walk around a mall to try things on and enjoy the scenery, but online shopping is a much better choice. Usually, when I am out shopping, I like to keep my phone with me and see if I can get a better deal online versus buying it from the store and nine times out of 10 I can! So now that you know the awesomeness that is Beesavy go sign up! 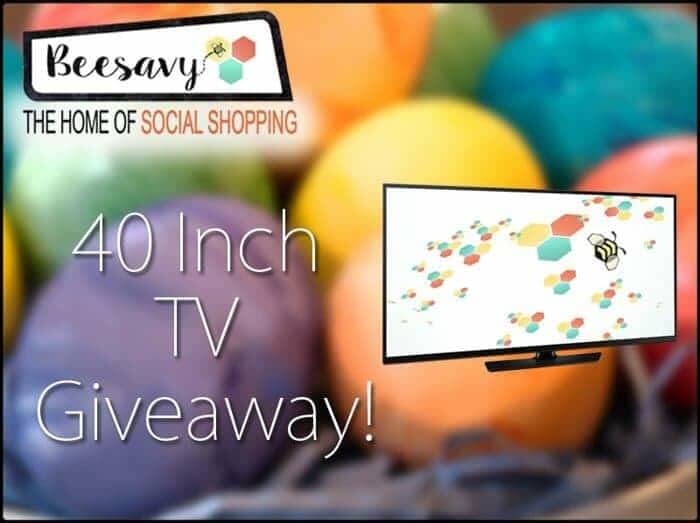 And when you are done, scroll down and enter to win a 40″ TV from the awesome people at Beesavy! Open to US residents and Ends on May 01, 2017 11:59 PM EST. Enter using the form below and good luck! Disclaimer: Work Money Fun is not responsible for the prize. The event is organized by SavingYouDinero.com, and free TV is provided by Beesavy. Our oldest TV is about 15 years old and it’s a TV/DVD player combo. I am still using my 12 inch TV from 1997 with a VCR player in it. I have managed to rid myself of all my old t.v.s. I have two Sony 32″ t.v.s currently and I am looking to upgrade to a larger screen. In our basement our TV there is about 10+ years old. The oldest one is a 9inch tv/VHS combo! My oldest TV is about 15 years old. It is an old one, not like the ones they sell today. No one uses it. The oldest tv I have is in the living room. I think it’s about eight years old now.